Welcome to A.J.Thomas Campers your agent for Quest RV, Bushranger and Pioneer camper trailers. We also offer an extensive range of accessories and repair facilities. At A.J.Thomas Campers, camper trailers are our life. 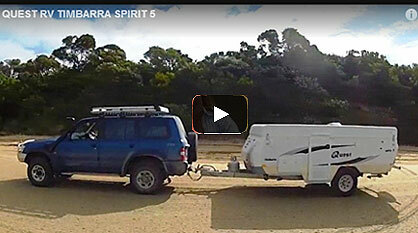 We have over 20 years in the camper trailer industry and pride ourselves on our knowledge and experience. That’s why we are the proud agents of Australia’s most popular and leading names. A.J. Thomas campers, the closest camper trailer store to Melbourne’s CBD, offers plenty of experience and know-how. Running the business with his Son Dean, Alun Thomas started A.J. Thomas back in 1978 specialising in camper trailers. Try-before-you-by is a strong element of the business, with a fleet of Quest Rv wind up and Pioneer fold-out hard floor camper trailers for hire. Many of our rentals turn into purchases.